There was a time when I assumed that cloudy days, daily regular creams with (often) minimal SPF protection were enough to protect my skin against sun damage. Now, as an Asian beauty enthusiastic, seeing (at a young age) the first sings of sun damage on my face, I cant leave the house without any sun protection. A sunscreen protects your skin from sunburn, premature aging and minimalists the risk of skin cancer. Skin aging is mainly caused by sun damage, around 80% of wrinkles and hyper pigmentation are the result of sun exposure. UV rays damage your skin at a cellular and physical level. In the Korean / Asian beauty community, its generally knowledge that Asian sunscreens, especially Japanese, are superior to the western ones. The majority of Western sunscreen (especially US drugstore, there is a problem with FDA approving ingredients, but I have only experience with the European versions), leave a white cast, have a heavy texture, smell unpleasant and take forever to absorb. This is especially true for drugstore brands, there are some very nice french pharmacy sunscreens with up to date chemical filters, but unfortunately, even those don't rival Japanese formulations. Furthermore, in contrast to the western industry, which just mention that there is some UVA protection (who knows how much how much) the Japanese skin care industry has a 4 level ranking system measuring UVA protection, PA ++++ stands for 16 or above, persistent pigment darkening (PPD). 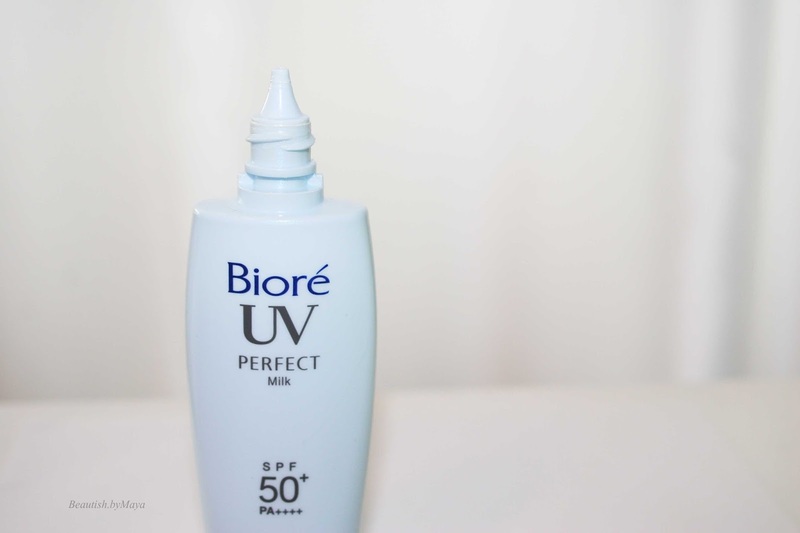 Now being back from holiday, I will write about my favorite summer product; the Biore UV Perfect Milk SPF50 PA ++++ sunscreen. I tan very easily, to be more specific, my skin first turns red and then gets darker in just a day or two. I used to tan on the beach before understanding the science of photo damage; stupid me, but its the fault of the western sun tanning worship culture. Now, I try to prevent skin tanning, you will always find me wearing a wide hat, and sitting under the parasol (especially between 12am-16am). My regular everyday sunscreen used to be the Hada Labo emulsion and Biore water gel, which is a nice products but not a good choice for the hot summer days, especially if you are planning outdoor activities. I have dehydrated combination skin which turns slightly oily in the summer. In contrast to the regular Biore water gel and cream sunscreens the Biore UV Perfect Milk is water, sweat, and sebum resistant, just as the name says it perfect for the summer. The lightweight milky sunscreen has SPF50 for UVB protection and PA ++++ protection, the upgraded Japanese rating system for UVA protection. I wouldn't even think about using less than SPF50 on my face in the summer. I couldn't find the Ingredient list for the 2015 version, but COSDNA has ingredient listened for the 2014 version, which is probably identical to 2015 version, and the Biore UV Perfect face Milk SPF 50 Pa ++++, of which Biore UV Perfect Milk is the upgraded version for face and body. According to Cosnda there are no major red flags. As with most Japanese sunscreens alcohol is high on the ingredient list, if you are very sensitive to alcohol this can be an issue. However, I find the alcohol very well formulated in the sunscreen, it doesn't irritate my sensitive skin and facilitates fast absorption. The product is not creamy but has a liquid milk texture, just as I like my sunscreen to be. Its very runny and has a soft, practically undetectable scent. 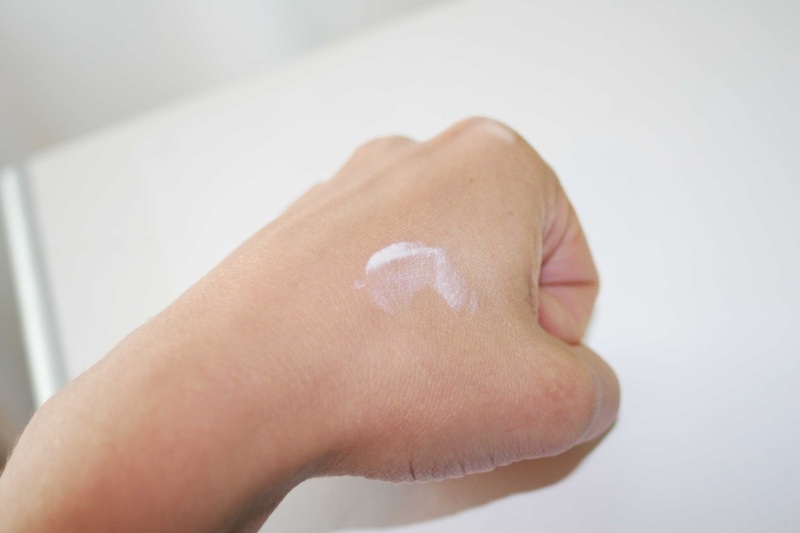 The color is milky white but doesn't leave any white cast or residue behind. I apply it 5-10 minutes after the emulsion/moisturize step. Its really lightweight and you can built it up and it will stay undetectable on your skin, absorbing in 1-2 minutes. Further, its also a nice base/primer for a foundation, cushion or BB cream. I found the texture to be very pleasant, the sunscreen didn't cause any reaction on my sensitive skin. I used the Biore UV Perfect Milk during my entire holiday, spending time on the beach, mountains etc. The sunscreen did a good job at protecting my skin, the best think was its long lasting power, resistance to water and sweat. I did have to reapply the sunscreen every 2-3 hours as the sun was very strong. One advice, If you want to reapply sunscreen I would use blotting paper first. Did my face burn? No, luckily I managed to avoid that. Did my face tan? Yes, Unfortunately it has become one shade darker, nothing dramatically compared to my previous holidays. When on summer holidays and in the summer generally its very difficult to prevent any tanning. I applied sunscreen religiously every day, it was only 2 times that I forgot to reapply sunscreen on the beach. Overall I'm loving this sunscreen, its perfect for the summer - sweat, water and sebum proof, while being lightweight. Its definitely better than any Western sunscreen I had ever used in the summer. The majority of western sunscreens, leave a white cast and feel heavy on the face, you just want to take it off ..!!! I guess even the good french sunscreen cant beat the Japanese ones. I think its also important to know the level of UVB protection. Mentioning to the consumer that there is some UVB protection doesn't mean a lot, please western brands wake up! In addition, its a Japanese drugstore brand, very affordable. I bought it for 8 euros on eBay, but you can get it cheaper especially in japan. 8$ at amazon* for US. 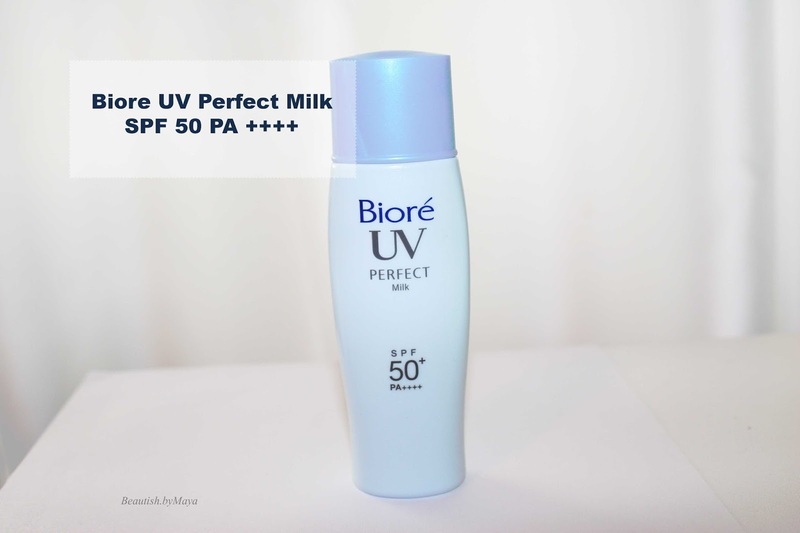 The Biore UV Perfect Milk SPF50 PA ++++ is a perfect choice for the hot summer months. If you have oily skin it will work perfect for the entire year around, if your skin is more dry then it will still work good in the summer, but will be drying - mate during the colder months.